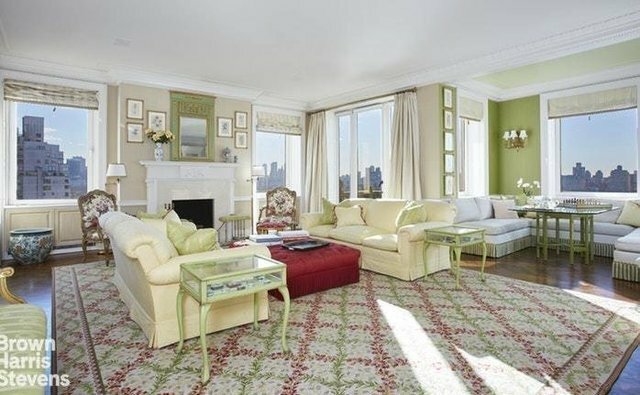 Resting high above the beauty and grandeur of Central Park, in a building designed by master architect Rouse & Goldstone, this pristine residence offers unsurpassed views of the Jacqueline Kennedy Onassis Reservoir, and the Magnificent New York City skyline to the west and south. Exquisitely designed, this elegant apartment, in one of Carnegie Hill's premier cooperatives, is adorned with museum-quality finishes and it provides lovely spaces for entertaining or private relaxation. PERFECT FOR ENTERTAINING: A passenger elevator opens onto a private landing, which leads to a generous foyer. Just down the hall, past a charming powder room, is a spacious living room with a loggia, access to two terraces, a beautiful woodburning fireplace with antique mantel, and reservoir views , all of which make this a warm and inviting space for entertaining. The adjoining west-facing terrace has a limestone balustrade and an ornamental pediment. It serves as the ultimate position from which to experience world class views of the Jaqueline Onassis Kennedy Reservoir, all of Central Park, and the skylines along of Central Park South and Central Park West. The George Washington Bridge to the north and the Empire State building to the south are visible from this remarkable vantage point. A second terrace, facing south and east, connects the living room to a grand dining room, with a fireplace of its own, two sets of French doors to the terrace, and a wet bar. A convenient serving pantry connects the dining room to the kitchen - an especially felicitous arrangement for formal dinners. The kitchen features a large breakfast room that basks in morning sunlight and is perfectly suited to informal meals. PRIVACY AND LUXURY: A large and comfortable library serves as a handsome sanctuary with a woodburning fireplace, and lustrous wood paneling, as well as marvelous appointments and its own half bath. Accessed through double doors, A smaller study has views to the south and east. Two well-proportioned bedrooms have en suite baths and plentiful storage while a spacious third bedroom sits at the apartment's west end. Stunning views to the west over Central Park are the crowning glory of this luxurious retreat. THE SETTING: Set on Fifth Avenue in prime Carnegie Hill, one of New York's most sought-after neighborhoods, the building enjoys proximity to Manhattan's abundant attractions and cultural pursuits, including five-star restaurants, world-class shopping, art galleries, and theaters. In the heart of Museum Mile, the building is close to the Metropolitan Museum of Art. Eight other extraordinary museums are a short distance away. This is truly an address of distinction in one of the world's most exciting cities.